Planing attachment to the left. The cabinet looks in good nick. You get four speeds instead of two. The extension bed bar with the table saw clamp. 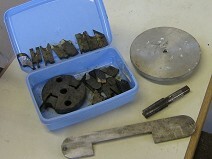 The grinding wheel, arbor and guard showing the clamp. The tilting sanding table and sanding disc with a tape measure thoughtfully provided by Ernest. 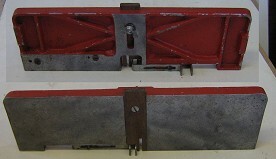 A hold-down spring for use with the moulding block. The saw table bed and random hole. not sure what that's about. 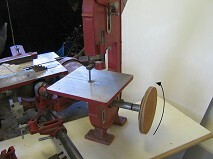 Above is the Ionic bandsaw attachment with an extension bar for a sanding disk. Belt guard, possibly from the planer/thicknesser. The under-saw guard with hinged front to allow swift blade changing. A great set of pictures for which I thank you most earnestly, Ernest. The polyvee pulleys. Much easier to change belt speeds. The planer/thicknesser is attached at the far end of the extension bar. The clamp sits on a saddle on the bedbar while the arbor is mounted on the spindle. The locking nut for the headstock that swivels around 90 degrees to allow larger bowl turning. The saw table with a rip fence that seems to be from another machine as it's blue. Underneath the saw table showing the table tilting mechanism on the right. Bandsaw pic from the manual. The dual spindled motor allows the planer/thicknesser to be powered. The mortising attachmentt with mortise bit and chisels. This also is mounted on a saddle on the bed bar. The moulding block with a good range of cutters ad the specially widened table insert for moulding block use. All in all a classic little machine with a fine range of attachments which clearly demonstrate the versatility and intelligent design of Coronet machinery. Charles Parker, we salute you.